An arched firebox opening made in a transitional style. A mix of traditional and contemporary. Nevada Cast Stone Fireplace surround is pictured here made from GFRC. This is a traditional rustic design that has old world roots. 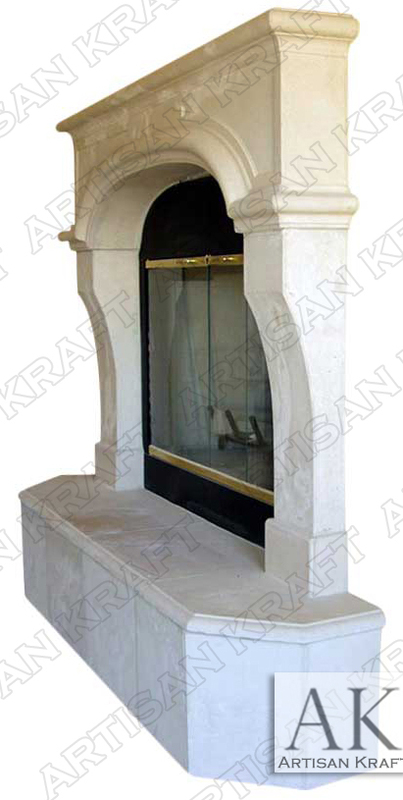 We offer replicas of antique mantels made from marble, limestone or cast stone. These historic old world styles are the base of even modern designs. This is a man made stone that looks and feels like limestone. It is lighter in weight making it easier to install. A good example of a raised hearth with angled corners. Stone: GFRC, limestone, sandstone, marble, travertine etc. Available in many different colors, textures and finishes.